If there is one thing I have a hard time with during the winter, it’s chapped lips. The pain is irritating and it takes a while to get lips back to normal. In my quest for healthy lips, I’ve tried many types of lip balms. Some are better than others. In addition, many are similar. 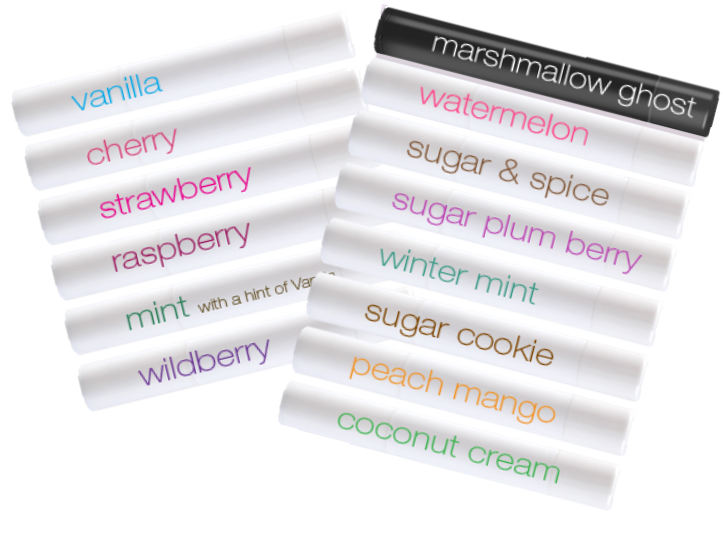 If you have lip problems to, take a look at the balms that have worked the most for my lips. My first experience with Blistex happened in my teens. It was during the summer and my lips were in bad shape. So, my mom bought me Blistex Medicated Lip Balm. My first application burned because it was going to work on my wounded lips. At the time, I didn’t like it. I wasn’t used to this feeling and didn’t want to use it. surprisingly, my lips were back to normal and didn’t burn anymore. I realized, the Lip Blam was trying to protect my lips, but had to sooth and prevent further drying. Even though it didn’t burn anymore, I didn’t like the medicated smell and taste. As a result, I searched for a new lip blam. 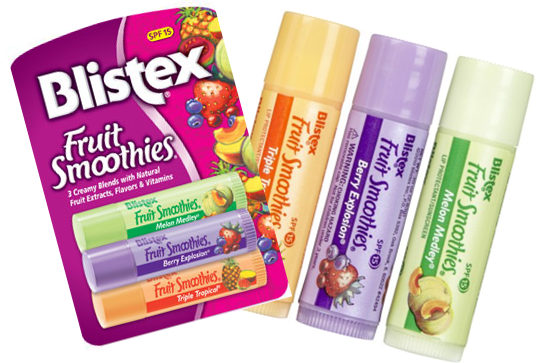 If you’re looking for a lip balm that smells great and works, Blistex Fruit Smoothie is for your. Blistex Fruit Smoothie comes in three flavors. Those are Melon Medely, Berry Explosion, and Triple Tropical. They are unique and fused with fruit extract and vitamins. I would only recommend this lip balm to someone whose lips aren’t starting to show the wear and tear of winter. This balm is not medicated and it doesn’t have SPF 15. In my opinion, Fruit Smoothies is like and adult Lip Smacker. A regular application of these three lip balms will keep your lips smooth and hydrated! One of the reasons, I’m always looking for lip balm is I have a bad habit of losing them. As a result, I try to get several tubes and place them within bags, dressers, and my medicine cabinet. After too many tubes disappeared, it was time to get new chap stick. During a shopping trip for college essentials, I remembered I was out of lip balm. Unfortunetally, I was already at the check out line in Wal-Mart. Fortunetally, I saw a two pack of Soft Lips Lip Blam. The price was reasonable and I’d seen ads on it. So, I decided to go out on a whim and try it. It was the right choice, this balm was like a combination of Blistex’s Medicated Balm and Fruit Smoothie. The difference is this balm is 5% stronger, has a slender cylinder tube, and comes in a variety of scents and flavors. Of all of the products I’ve used, Soft Lips is my favorite, but it’s always good to have an alternative. Auqifina is a recent product I’ve started to use. 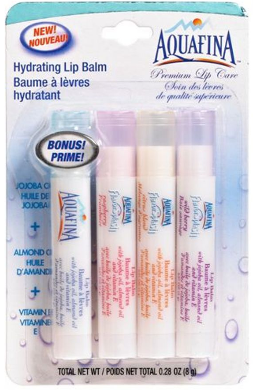 Until I graduated college, I did not know Auqifina made lip balm. I knew it made water. So I was a little skeptical about it. I bought this lip balm, because I couldn’t find Soft Lips and didn’t want to use Blistex Medicated Balm or Fruit Smoothie Blam. On the bright side, Aquifina is just as good as Soft Lips, and it contains more balm than soft lips. So, it won’t run out as fast. These four are my favorite lip balms. You may have noticed I didn’t mention Chapstick. Honestly, I don’t like it. The balm doesn’t spread as evenly as the other brands, and it gets hard very quickly. This brand is usually a last resort for me. Do you use any other brand listed above? If so, What do your like about them?